Being a WorkMail user, I always face problems while backing up its data. But, after trying Kernel Amazon WorkMail Backup & Restore tool, I can easily backup my data anytime and anywhere. I was looking for a solution to backup my Amazon WorkMail mailboxes to PST file, but without using MS Outlook, then I get to know about Kernel Amazon WorkMail backup & Restore tool which allowed me to backup WorkMail to PST file. Users can backup Amazon WorkMail mailboxes to Outlook PST file using this tool. It backups emails and all other mailbox items maintaining data integrity and the folder hierarchy intact. The tool backups multiple Amazon WorkMail mailboxes at a time to PST files. For this you need to have user account with permissions on all WorkMail mailboxes. And the mailboxes can be added manually or using a CSV file. The software can also backup public folder and Archive mailboxes. 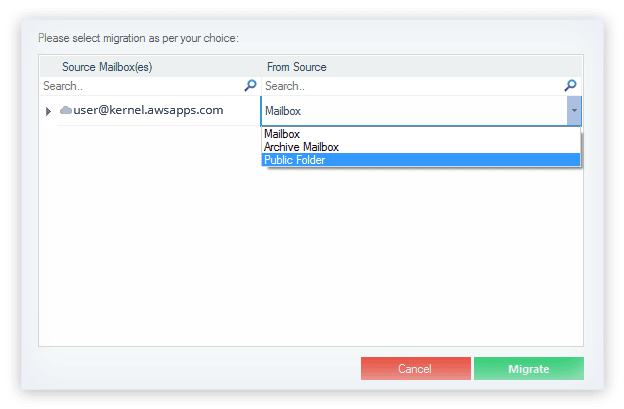 Also, the tool supports importing PST files to archive mailboxes and public folder. Users can select the required option—mailbox, archive mailbox, or public folder— after the addition of source/destination while backing up/ restoring. Adding WorkMail mailboxes or PST files is essential while backing up or restoring mailboxes. Amazon Workmail Backup software simplifies this task with the help of a CSV file. By providing details like source, destination, etc. in a CSV file, you can automate backup/restore operations. Users can import healthy Outlook PST files to multiple Amazon WorkMail mailboxes using this tool. The added PST files can be mapped to the required WorkMail mailboxes. The tool has advanced filters like Date Range and Item Type to let users perform selective backup and import. Also, it has folder selection and exclusion (to skip empty folders or Deleted folder) options. After Backup or Restore, users are provided with a summary or log report. Users can save it in CSV format. The log report includes details like source, destination, type of folder selected, etc. You can perform both Backup and Restore operations free using the Free version of the software. And you can save up to 10 items/folder for each mailbox. How to Backup Amazon WorkMail? AddAdd the Amazon WorkMail account for Backup. SelectSelect the source option - mailbox, public folder, or archive mailbox. BackupFilter the items and back up the desired data. 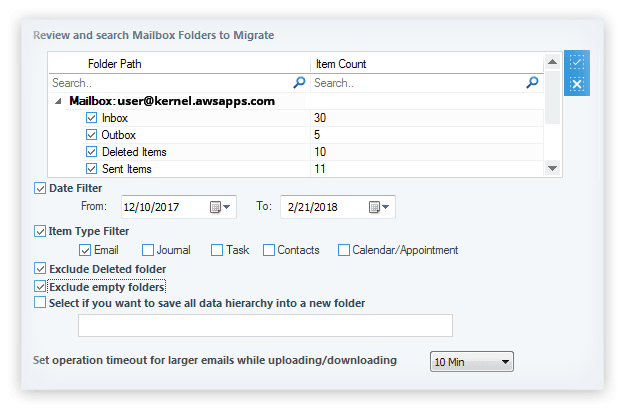 How to backup multiple WorkMail mailboxes with this software? Do we need to install Outlook to use this software? No. The software performs backup/restore operations without the MS Outlook application. You need PST files and Amazon WorkMail account details only. Does this software also restore mailboxes to Amazon WorkMail? 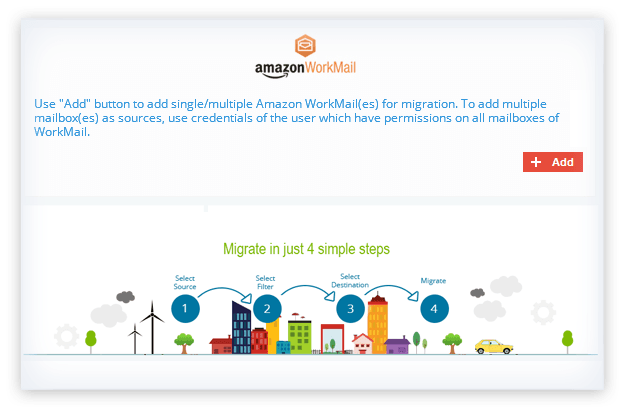 With this utility, you can quickly restore Amazon WorkMail mailboxes. All you need to do is select the Restore option and follow as per instructions. Can I skip some folders if I don’t want to backup those mailboxes? Yes, using the exclude folder option of the tool, you can easily skip those folders or items that you don’t want to backup. Can I backup an archive mailbox data using this tool? Yes. You can backup up Mailboxes, Public folder, and Archive mailboxes. You can select the required option after providing the source credentials. No, it’s not completely free with all the features. However, you can use the trial version of the software that allows you to backup & restore up to 10 items per folder. Quickly export Amazon WorkMail mailboxes, archive emails, public folders to PST. Quick migration of Outlook PST/OST files to Amazon WorkMail mailboxes. Get this software asap if you are suffering from data lost. Best tool in the market. Happy with the results and started recommended it now to others. "Even if you are satisfied with the product and how does it perform you still want services to be that good and I am glad they have not forgotten this. 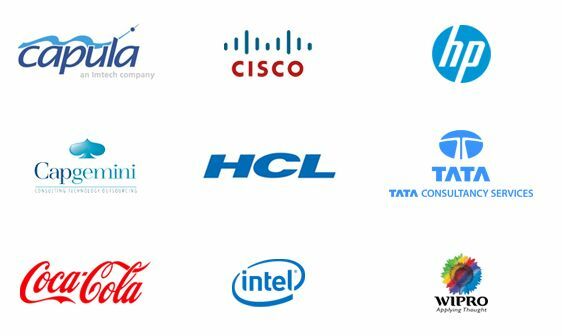 Once you are with them they never let you fight alone with your technical glitches."